Barbados will remember its veterans of the two World Wars in a brief Ceremony and Military Parade. An Interdenominational Service will be held. Governor General, Dame Sandra Mason; Prime Minister, the Hon. 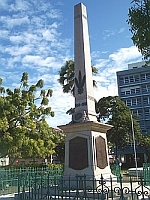 Mia Amor Mottley; Chief Justice, Sir Marston Gibson; Leader of the Opposition, Bishop Joseph Atherley; members of the diplomatic corps and other dignitaries are expected to attend and lay wreaths at the war memorial. Armed and unarmed units of the Barbados Defence Force, Barbados Regiment's Guard of Honour, the Royal Barbados Police Force, the Barbados Cadet Corps, the Barbados Legion, the Barbados Fire Service, the Barbados Prison Service, the Boy Scouts and Girl Guides Associations, the St. John Ambulance Association of Barbados and the Barbados Red Cross Association will be on parade.